At Foundation Supportworks, Inc., we can inspect your foundation at no charge, providing you with a written quote for a solution that's warrantied to stabilize your home's structure. We have warrantied solutions that fix foundation wall cracks! Call us for a foundation inspection and free foundation repair quote today! 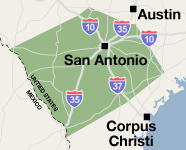 We serve Laredo, Victoria, San Antonio, and many nearby areas in Texas. Wall anchor systems, like our Geo-Lock™ Wall Anchor System, are ideal for stabilizing and potentially straightening foundation walls that are buckling due to pressure from expansive soils. To schedule your free quote, call or e-mail us today! We serve San Antonio, Victoria, Laredo, and surrounding areas such as New Braunfels, San Marcos, Eagle Pass, Del Rio, Seguin, Kerrville, Beeville, and many areas nearby.